Born in 1957 and raised in Coney Island, N.Y. Daniel moved to Florida with his parents during his senior year of high school. In his early twenties he found himself in the art and framing business. With more of a common sense left brain opposed to an artistic brain he did very well in a business that has seen many ups and downs and great losses of friendly competitors. After 35 years of appreciating and developing a love of art in all mediums he became interested in wood working. Living with his best friend and multi media artist Jacqueline Mack, he was encouraged to pursue a hobby in wood from her and a long time friend that got him interested in wood turning. Before purchasing a lathe he wanted to learn other types of equipment so he began with swings, table tops, benches and even cutting boards. As a full time business man this leaves mainly weekends to help with house projects, two fun loving golden retrievers (Bella & Mango), previous hobbies that seem hard to give up (exotic plants) and spending time with family and friends. There is not a lot of time left for turning, but when the wood starts chipping away it is non stop work and play. 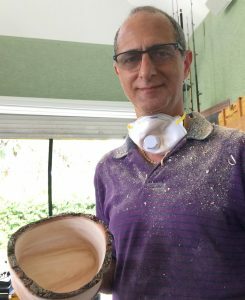 His finely crafted hand sanded bowls speak volumes for his love of nature and eye for design. Wood wood and MORE wood! The majority of my product materials are from local trees. When trees come down after hurricanes, new construction, or removal, I'm able to collect the materials I need. I am often asked "How long does it take to make an item?" From collecting and prepping the materials, to drying and shaping the wood, there are a lot of steps before turning. There's a lot of waiting around for the wood to dry, so I usually have multiple stages of projects going on at once. From start to finish it takes roughly 2-3 months to finish a couple of items. What do you use to finish your products? The natural grain and color of the wood is so beautiful that it's difficult to find a finish to compliment each piece. Depending on the piece, I will use oils or other finishes to bring out the natural beauty. Sometimes I'll use a bit of turquoise or resin to fill in any small imperfections.